The joke told around Ireland's watercoolers and in its office canteens in January went like this: "What's the difference between Iceland and Ireland? One letter and six months." A month on, though, and the joke's looking less funny and more like an accurate prediction. Ireland's banks are edging ever closer to the brink of meltdown, and some analysts say six months looks a little too generous. Take Allied Irish Banks. The country's biggest lender revealed this week that its pretax profit dropped 62% in 2008. The bank's share price slid 90% last year. In any other country, worried customers would already be queuing to withdraw all their money. But so far Ireland has avoided a run on its banks, thanks largely to the government's decision in October to guarantee deposits in six Irish banks, as well as those in five foreign institutions, for two years. The Irish guarantee was heralded in some quarters as a model solution for restoring confidence, with several E.U. states following suit. But five months down the line, and with Ireland's public purse tightening, the government's promise is looking harder to keep and a run on the banks ever more likely. According to Ray Kinsella, an expert in financial institutions based at University College Dublin, a run on Irish lenders might still happen if the banking crisis continues. "Unless we get a handle on this, then all bets are off. That's the train on the horizon that's coming toward us. You reach a point where giving guarantees becomes counterproductive," he says. Ireland's downturn has also laid bare some ugly home truths  scandals indicative of a boom-years culture of nepotism and scant regulation that some say is as much to blame for the nation's economic malaise as the global downturn. In December, it emerged that Sean FitzPatrick, the then chairman of Anglo Irish Bank, Ireland's third largest bank, had concealed from shareholders more than $100 million in personal loans by transferring them temporarily to a building society. After FitzPatrick quit, the Irish government stepped in to nationalize Anglo Irish, but the damage to public confidence had already been done. Anglo Irish has been the bank of choice of the wealthy builders and developers who reaped the rewards of Ireland's colossal property boom during the "Celtic Tiger" era of the 1990s. 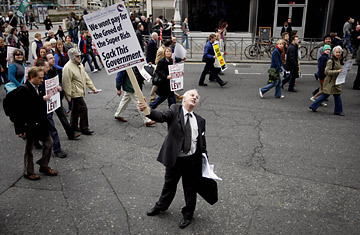 They also tend to support Fianna Fail, the party at the head of Ireland's coalition governments for the past 12 years. Following the FitzPatrick loan scandal, it emerged that 10 Anglo Irish customers, since dubbed the "golden circle" by the Irish media, were lent more than $560 million to buy shares in the bank  a deal that may have broken laws on market abuse. To date, only a fifth of this loan has been repaid. The government has repeatedly denied allegations of links with the Anglo 10, but despite public calls to name and shame them, the customers' identities remain undisclosed. Irish voters are now venting their rage. On Feb. 21, the country saw its biggest public demonstration in a generation as 120,000 people took to the streets of Dublin. Most were civil servants protesting a levy on public-sector pensions, which the government says will save the country $1.2 billion. Unions are currently balloting members on a planned general strike for March 30, with the head of the country's trade-union umbrella group warning of a "doomsday situation" should the government fail to introduce a recovery plan that gains the support of social partners. According to the most recent opinion polls, only 10% of Irish voters say they have confidence in Prime Minister Brian Cowen's government. "People are very, very angry about these scandals and the skulduggery that was going on in the banks," says Peter Bunting, assistant general secretary of the Irish Council of Trade Unions. "We need everyone to put their shoulder to the wheel. It shouldn't only be the low paid." With local and European elections in June looming, Cowen has the dual task of saving his party at the polls and repairing the damage to Ireland's international reputation. Once the shining economic success story of Europe, the country has been routinely described in recent months as the weak link in the euro zone and even suffered the ignominy of being cited as a potential recipient of aid from Germany last week, alongside other struggling E.U. states like Hungary. In his keynote speech to a somber Fianna Fail party conference over the weekend, Cowen told Irish voters to expect higher taxes. "Everyone will need to pay more," he said. But with a public appetite for bank-baiting still strong and further wage cuts and job losses on the horizon, most Irish voters are unconvinced that the burden of recovery will be equally shared. Irish voters may be angry, but they're likely to get a whole lot angrier.